Hyaluronic acid is regarded as the miracle cure against aging par excellence. It is widely used in the cosmetics sector. But this is not where the areas of application of hyaluronic acid end. More and more, this active ingredient is also being used to treat problems with joints. 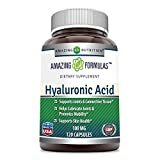 SUPPLEMENTION MADE EASY Every capsule of our Hyaluronic acid supplement provides 100 mg dosage of hyaluronic acid which is an optimum dosage to reap its benefits. All Amazing Formulas products are manufactured in accordance with Good Manufacturing Practices (GMP), among the highest standards in the world. The joint surfaces of the human body are composed of cartilage mass. The cartilage mass is kept intact and supple by hyaluronic acid in the function of synovial fluid. Thus the cartilage mass is washed around by the hyaluronic acid, whereby the optimal mobility as well as protection are offered. With increasing age, the joints wear out, which can lead to various problems and pain for those affected. The wear and tear of the joints that gradually occurs is also known as osteoarthritis. Not only old but also young people suffer from this. Hyaluronic acid is so popular in cosmetics as well as in medicine because of its excellent tolerability. The risk of side effects is relatively low. But the therapy with hyaluronic acid is still controversial in medical circles. The reason for this lies in the fact that the hyaluronic acid supplied is rebuilt by the body in a relatively short time and the treatment must therefore be repeated again and again. In addition, the desired effects of hyaluronic acid in arthritis can usually only be achieved at the onset of osteoarthritis. In addition, some doctors claim that hyaluronic acid can cause inflammation in the joints. However, the side effects are generally largely unknown. In some cases, intolerance reactions of the skin were reported, as well as infections after an injection. However, it is difficult to say whether this is actually related to hyaluronic acid or rather to insufficient sterile work during injection. In addition, hyaluronic acid of animal origin may cause allergic reactions in some people. Before using hyaluronic acid, the origin of the hyaluronic acid to be used should therefore always be clarified beforehand. In this way at least possible allergies can be avoided. Advanced Antioxidant Serum - An indispensable nutrient for collagen production, vitamin C synergistically blends with Botanical Hyaluronic Acid and Vitamin E in this advanced formula designed to target the most common signs of aging including brightness, firmness, fine lines, wrinkles, dark spots & sun spots. THE DIFFERENCE in skin treated with TruSkin Vitamin C Serum is striking. See thousands of reviews from real Amazon customers below rave about brighter, fresher looking skin, improved tone and clarity, smaller pores, less breakouts, fine lines and dark spots. Plant Based Formulation - Free of synthetic color additives, fragrance, and stabilizers, dynamic active botanicals like Aloe Vera, MSM, Botanical Hyaluronic Acid, Witch Hazel and organic Jojoba oil combine in a silky smooth serum that can be used day or night. Leaping Bunny certified CRUELTY FREE. Formulated and bottled in the USA. 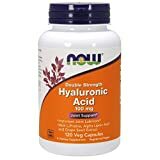 Maximum Strength Hyaluronic Acid, 100mg,180 Capsules, Powerfully Supports Skin Hydration & Joints Lubrication. Non-GMO, Soy Free, Gluten Free and Made in USA. 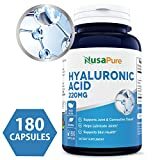 Nature Bell Hyaluronic Acid Capsules (Sodium Hyaluronate). Highest Potency and Non-GMO. Strongly Supports Youthful Skin and Healthier Hair, Nails, Bones, Cartilage and Joints. Non-GMO, Gluten Free, Dairy Free, Sugar Free,Tree Nut Free, Soy Free and Egg Free. Manufactured in California in FDA Registered Facility. All 3rd Party Lab Tested. 1 Year Unconditional Money Back Guarantee.